Add a touch of class to your retail store with our Elegant Swirl Paper Shopper. 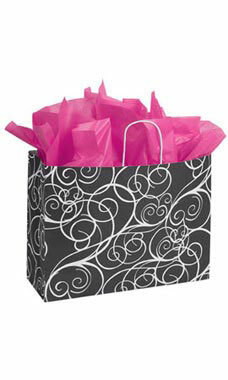 These paper shopping bags feature a black background with beautiful white swirl accents, with a white twisted handle. Elegant Swirl Paper Shoppers are exclusive to Store Supply Warehouse. Sold in cases of 25.